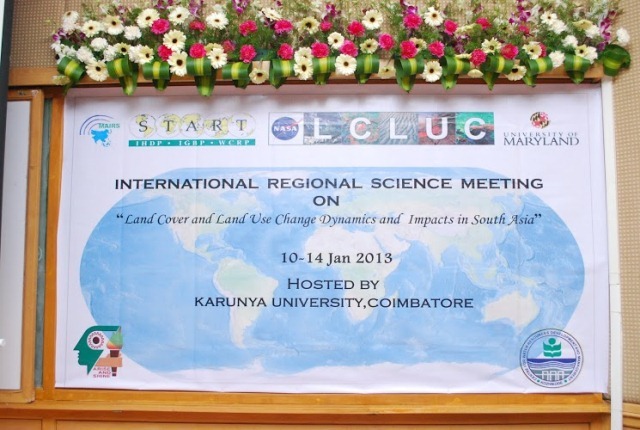 The purpose of this international meeting is to provide an international forum to bring scientists together to discuss land-cover and land-use change (LCLUC) and its impacts, with a regional focus on South Asia. This science meeting is organized as a joint effort of the NASA’s LCLUC Program, the Global Observation for Forest and Land Cover Dynamics (GOFC-GOLD) Program, the International System for Analysis Research and Training (START) Program, the Monsoon Asia Integrated Regional Studies Program (MAIRS), the University of Maryland, the Centre for Water Resources Development and Management (CWRDM, Calicut, Kerala), Karunya University (Coimbatore, Tamil Nadu). The meeting serves as regional Science Team meeting for the NASA LCLUC Program. It is organized around 5 themes: (1) agriculture and water resources, 2) biomass burning, including land-atmosphere interactions, including biomass burning, 3) urbanization, and 4) land use in coastal zones and estuaries, and 5) land use in mountains. Overview presentations will present recent research accomplishments and the state of the art on these topics in South Asia, and formulate future research directions and applications development needs for the region. The meeting will explore opportunities for coordination and collaboration among research scientists and teams and ongoing projects aimed to advance our understanding of the spatial extent, intensity, social consequences, and feedback to regional climate, of the large-scale land-cover changes underway in South Asia.